No matter how much we wish there was some kind of foolproof strategy we could apply when playing keno, the fact remains that keno is a game of chance, pure and simple. While there may not be anything you can do to influence the outcome of a keno draw, there are a couple of handy hints to consider which may increase your chances of winning. Using these tactics combined with good old fashioned luck we hope you can maximise your keno wins. Did you know that the house edge in online keno is significantly lower than offline keno? When playing real money keno on the Internet the house edge usually sits around the 5 to 10% mark whereas playing offline has a house edge of up to a staggering 40%. That makes offline keno a casino game with one of the highest house edges of all. The house edge in keno varies because each venue offers different variations on the game and different rules as to the minimum and maximum numbers you can pick. Playing online allows you to be selective about which game you play, finding one that suits your budget and comes with a lower house edge. This one’s a no brainer really; play online for better odds and therefore a higher chance of winning. Picking more numbers in keno means you have a higher chance of winning, but the more numbers you choose, the lower the payouts are. For example, if you pick only one number and you’re lucky enough to land that digit, your payout is typically one to three. Pick five numbers and landing one of those numbers will only pay one to 0.5, so you wouldn’t even break even. This one really comes down to your personal choice, but keep in mind that picking less numbers doesn’t mean you’ll win less money. 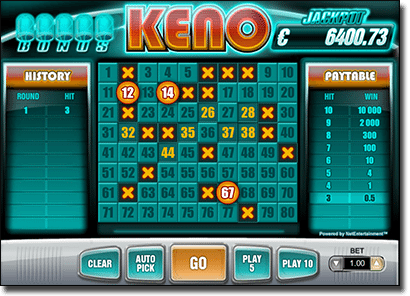 Like the lottery, keno players can access databases that will tell them the previous numbers that have been drawn on a keno game. Some players employ the strategy of looking over the recent lucky numbers and using these to make their picks. It sounds like a decent enough idea, but the reality is that there is absolutely no formula or predictability to what keno numbers will be drawn. Just because the number 21 has been drawn in the last three games it doesn’t at all mean that 21 is more likely to be drawn on the next keno game. Our advice is to avoid picking these “lucky” numbers; it’ll just add more time and energy to gameplay without increasing your chances of winning in any way. One widely recommended strategy is to have a pre-determined set of numbers that you use for your picks in every keno game. This will save you time trying to think of which numbers to bet on and given that the results of each game are 100% random, you’ve got just as good chance as any that some of these numbers will eventually show. Some people pick special dates like birthdays or anniversaries but every number has equal chance of making you a winner. Not only is the house edge better when playing online keno, but you also have the ability to control the speed of the game. Unlike playing in a real keno venue where you have to wait for results to be drawn every five to 10 minutes or so, online keno is available when you want it. You can use the auto-pick function which will select numbers on your behalf with the click of a button, with results appearing within seconds. Quicker games means you can place more picks in a shorter amount of time, maximalising your chances of a win. These sites give you the option of playing keno for free in demo mode before committing to any real money wagers, which is a great chance to try out some of our suggested strategies and also the best way to realise that ultimately there is nothing you can do to control the outcome of a keno game.